I didn't hesitate a second to grab this great deal. The total retail value of the box is over Php 2000 (Php 2308.50 to be exact) and GlamourBox is practically giving out these babies for only Php 595 (including shipping). These products are really of great quality, my favorites are the Belo Face Cover with SPF40 and the Belo Body Shield with SPF60. I have been using these two for more than a week now. These are not your average sunscreen. They definitely are non-greasy, do not leave a white cast on your skin and don't make you feel sticky after you apply them. They just absorb like lotion and are actually very good skin moisturizers. Most of all, these are paraben-free. I am thinking of getting another box just for backup since with the rate I am using them, I'm quite sure I will run out in a month or so. I can't recommend these enough. GlamourBox really upped the ante this time. They have really great customer service (quick to answer my question in their Facebook) and they shipped my box quickly. I got it within 3 days of placing my subscription. 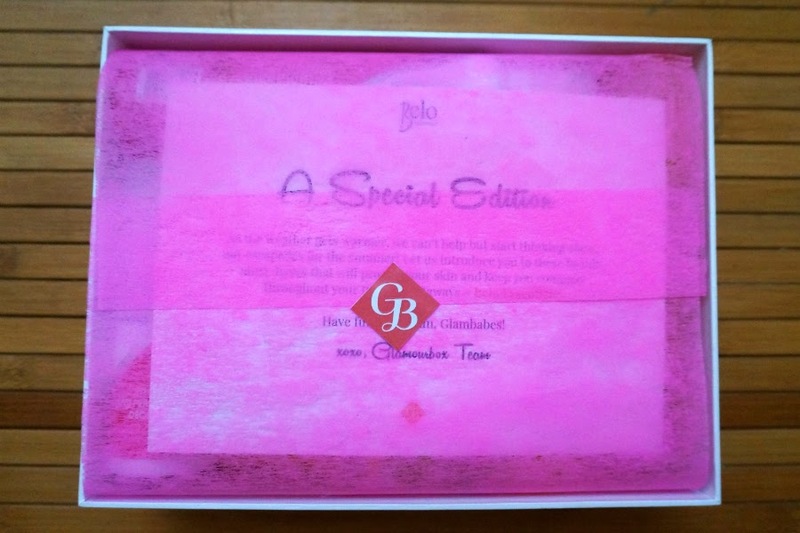 You can order your very own GlamourBox Belo Essentials HERE.